Blog: WOW! We have updated 5 programs! 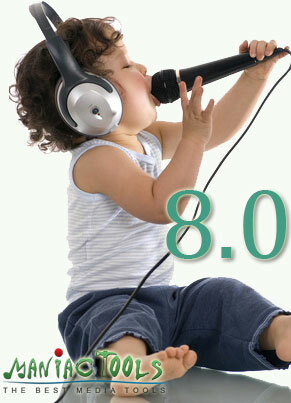 Today is a great day, we release 5 our programs under the version number 8.0. Before we discuss the new features, I would like to shed some light on the history. To create our multimedia software, we chose the Pascal / Delphi programming language and the Delphi IDE. For a long time the programs were compiled in Delphi 7, the IDE released in the far 2002. During this time, several versions of both Windows and Delphi were released, but for a number of reasons we continued using the older version of IDE. The resulting programs worked pretty well on Windows XP, Windows Vista, Windows 7. But still there were several drawbacks. The main drawback, difficult to accept in 2013, was the absence of Unicode support. That was why we decided to transfer our source codes to the new Delphi XE3 IDE released last fall. It was not a trivial task, these IDEs had 10 years (!!!) of differences. However, we knew that the upgrade was essential, and we finally succeeded. Our programs complement one another, so after buying one program, our users typically bought another one, then yet another, etc. For example, a user could buy the mp3Tag Pro tag editor, then AudioConverter Studio, our audio file converter program, then Visual MP3 Splitter & Joiner, the audio splitting and joining tool. Now you can purchase a single license and use it with each of our best 5 programs included into the package at once! The programs include: mp3Tag Pro, the powerful ID3 tag editor and audio file renaming tool; AudioConverter Studio, the converter of popular audio formats (MP3, WMA, FLAC, APE, etc.) and Audio CD ripper; Music Duplicate Remover, the program that can find and delete duplicates of audio files using ID3 tags, file parameters, or comparing the audio itself; Visual MP3 Splitter & Joiner, an audio splitter and joiner that supports various splitting methods (by pauses, visually, by number of parts, by size, using a CUE sheet, etc. ); MIDI Converter Studio, the MIDI to MP3 converter program that supports SoundFonts. We plan on adding further programs into the package after making their source codes compatible Delphi XE3. We also decided against paid upgrades for major versions. If a user bought the 6.x version in September, and the 7.0 version was released in January, the user had to purchase the major upgrade (even if with a significant discount). Now you can choose how long you'd like to receive ALL updates (8.0, 8.1, …, 9.0, 9.1, …, 10.0, etc. ): for one year, or for all future versions of the programs. Please note that the first option is the time-limited subscription, your license will expire in 1 year since the purchase date. Of course, the main change is the full Unicode support. This includes filenames, folder names, and ID3 tags. If you are a music lover, this is a "must have"! mp3Tag Pro comes with some major interface changes. Now the main tag fields are displayed in the list next to filenames. It is now possible to apply filters and quickly select songs without tags, lyrics, or cover art. Additionally, we greatly improved the lyrics search feature, the old engine is now complemented with scripts. Music Duplicate Remover now can save results of a duplicate search and load previous results. Other programs include important bug fixes, updated support for new standards of tags and music file formats. If you used our program(s) previously, you can get a significant discount for the update to 8.0 and full access to the 5 programs of the package. Just contact us, sending your current registration details and the name(s) of the program(s) you purchased.